Do We Need More Youth Outreach Programs? Although we face many cultural issues today, addiction is surely among the most pressing. It’s a destructive, deadly disease that affects all sections of the population to some degree, which is why combating addiction remains a top priority of public officials and researchers alike. Lately, there’s been much discussion about risk factors for addiction. Through research and demographic studies, we’ve been able to make deductions based on the tendency of certain traits to appear more frequently among addicts than in the population overall. Basically, risk factors are those characteristics or attributes, which may indicate higher-than-normal susceptibility to addiction. And one of the demographic groups that many agree is at high risk of abusing alcohol and drugs is adolescents. There’s no denying that more and more youths are experimenting with substance abuse. For every incremental drop in rates of adolescent tobacco use that we’ve seen in recent years, there’s been an increase in alcohol or prescription painkiller use among school-age youths, particularly those in middle and high school. Moreover, we’ve seen that there’s no longer a clear “gateway drug” for adolescents. Instead, the use of any mind-altering substance makes it extremely likely — approximately a 70 percent chance1 — that an adolescent will also use other dangerous drugs. 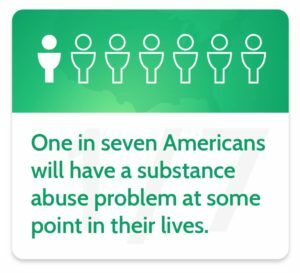 Alarming statistics such as this highlight just how early substance abuse can begin, and it becomes even more cryptic considering recent warnings by the surgeon general. According to the report, approximately 67 million Americans binge drink at least once during any given month while more than two-thirds that many people use drugs at least once over the same period of time. Moreover, there are over 47,000 deaths from drug overdose annually. More than half of those overdose deaths are from an opioid such as heroin or prescription painkillers. But despite the obvious prevalence of alcohol and drug abuse in the U.S., only about one in ten individuals who suffer from a substance abuse disorder are receiving treatment. While increased funding for treatment and addiction research is an ongoing strategy for getting more people into treatment, Murthy stated that an equally important strategy would be to stop addiction before it starts, which begins with youth outreach through education. Many of us participated in some type of education program for substance abuse and addiction while in school. Although some of these programs are more familiar than others, there are actually a number of them that are available. Perhaps the most familiar is D.A.R.E., which stands for Drug Awareness Resistance Education.4 D.A.R.E. was started in 1983 as a police-led educational program that’s currently offered to 35 million students from kindergarten through 12th grade. One of the highlights of D.A.R.E. is that, through both demonstrations and spoken lessons, students are not only taught about alcohol and drugs, but they learn a number of other valuable skills, too, including anger-management and conflict resolution. Similar to D.A.R.E., All Stars is a program designed to engage youths during this impressionable time in their lives, helping them to make smart choices.5 Additionally, cutting-edge psychological and developmental research went into the development of All Stars so as to encourage high levels of engagement from youth participants and to reinforce positivity. In addition to covering substance abuse and addiction, the program incorporates a number of age-specific topics, including socialization and relationship-building for younger participants and stress management for older teens. A program that’s quite different from both D.A.R.E. and All Stars is one called Across Ages, which assigns youths with mentors from their communities. The purpose of the mentors is to set positive examples and be role models for the adolescents.6 This strategy is based on the tendency for youths’ behaviors to be highly influenced by the behaviors of their peers as well as the behaviors of adults. Therefore, assigning each participant a role model will allow him or her to copy that person’s behavior while also being able to turn to the role model for social support. While not solely dedicated to addiction, Across Ages still covers topics like substance abuse and making good choices. But there’s potential for individualization, tailoring the topics to each youth’s interests, needs, and background. Clearly, there are programs addressing addiction that exist for youths, but the question is whether they’re actually reaching people and being effective. Adolescents and teens are one of the top demographic groups for growing rates of substance abuse, but Dr. Murthy asserts that the prevention education programs we have at our disposal aren’t are being implemented on a wide enough scale. This is especially alarming since the highest rates of addiction are among young adults between the ages of 18 and 25. In other words, evidence shows that many adolescents who experiment with substance abuse go on to become addicted just a few short years later, which is why Surgeon General Murthy is calling for stronger prevention efforts among youths via educational programs.